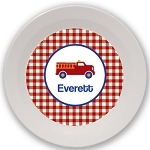 10" virtually unbreakable melamine plate printed with a custom name or monogram. Pretty yet durable for for everyday use. Just toss 'em in the dishwasher again and again. Makes a thoughtful gift for a first birthday. Order a whole set for the beach or lake house, and stylish outdoor entertaining. Dishwasher-safe, but not for use in microwave.